When it comes to nails, although a lot of polishes are three-in-one, I still prefer applying a base coat first and then finishing off with a topcoat. Although you can buy base coats and topcoats separately, lots of brands have value sets making it easy to get everything you need at a competitive price. 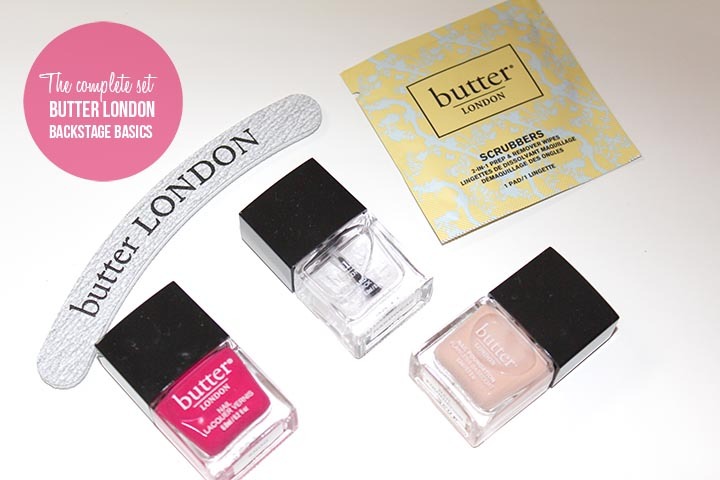 As part of their 2014 summer releases, Butter London is releasing a new and improved Backstage Basics Catwalk-Ready Manicure kit that has everything you need to get perfect nails. The kit includes smaller sizes of their Nail Foundation Flawless Basecoat, which protects nails from staining and fills in ridges, creating a perfect canvas for any colour; their nail lacquer in Snog, an opaque pink creme; Hardware P.D. Quick Top Coat, a quick-drying and chip-resistant topcoat; four Scrubbers 2-in-1 Prep & Remove Wipes, which takes off your old mani prepping for your new one; and a nail file and buffer. Housed in a chic, slim box, which would make any girl’s heart beat faster, the packaging also includes notes on how to create the perfect “waterless manicure”, which was developed at Fashion Week, where there isn’t much access to water. I gave everything a try and I feel like this is a great kit for those who are Butter London enthusiasts, beginners, or just looking for a fab gift. Although Snog isn’t my favourite colour, it’s a nice staple that should be in everyone’s collection. I also want to note that the colour only lasted a couple days before it started to chip. I’m not sure if that’s a Butter London thing (I only have one of their polishes) or the topcoat, or a combination of both. Overall, like I said, I think this is a great kit if you are looking for a base and topcoat. The Scrubbers work really well and took off all the colour relatively easily with just one wipe. 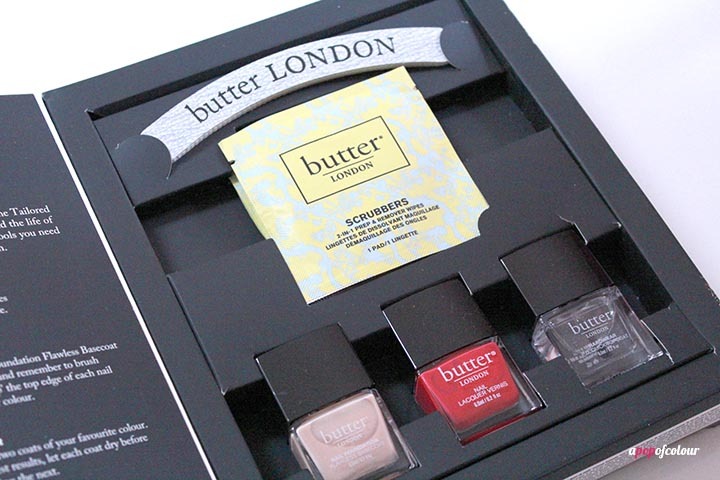 I have to say that this isn’t my favourite base/topcoat kit (I really like the Sephora Formula X one), but Butter London is such a prestige brand that honestly, if you were looking for a gift for someone, I think this would be great. Also, if you own a lot of Butter London polishes already, you might as well invest in their base and topcoat and be all match-matchy ;). Butter London’s Backstage Basics kit retails for $32 (a $42 value) and launches in July 2014. 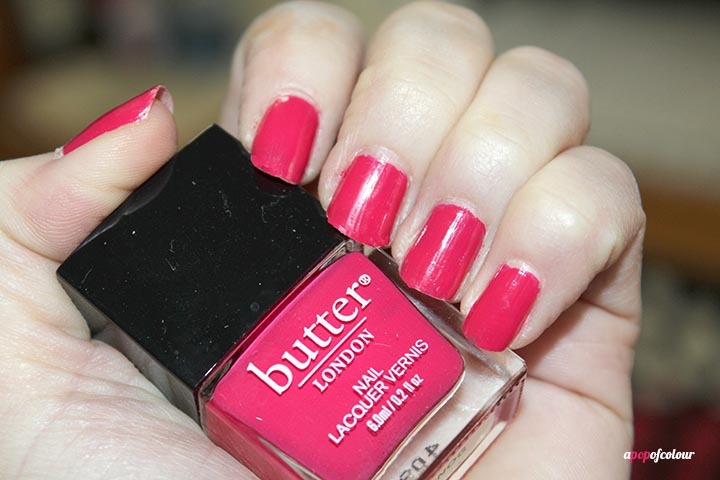 Are you a Butter London fan? Will you be picking up the Backstage Basics kit?